Memories of the "Squatter Man"
Many symbolic patterns around the world can now be seen as variations of the global "squatter man" or "stick man" first documented by plasma scientist Anthony Peratt. They are stylized derivations of a plasma discharge configuration seen in the ancient sky. The "squatter" or " stickman" figure is a ubiquitous symbol found in nearly every culture. It is often confused with a crude, distorted version of the human form. Some cultures speak of it as the big red man in the heavens. Below is a simple illustration of a three-dimensional plasma discharge form appearing above ancient sky worshippers, inspiring a vast array of mythical interpretations. The laboratory verified configuration includes a transparent “champagne glass” form above, a transparent “hollow donut” (when seen edge-on), and the “squashed bell” form below, all joined by an axial spine running down from the “head” of the figure. 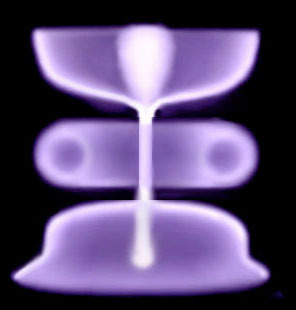 When appearing in the heavens, this plasma discharge column--the axis mundi of world mythology--evolved through a series of "plasma instabilities" documented in high energy laboratory experiments. Seen here are examples (left to right) from Armenia, United Arab Emirates, Spain, Arizona, and Guina. As we have noted in previous Pictures of the Day, a columnar discharge current breaks up into a string of sausage-like cells—usually 7 to 9 in number—which evolve into donut-like ring currents (toroids). The stacked toroids flatten into disks, and their edges fold away from the disk plane—upward in the top toroids and downward in the bottom ones. The form that we see as the "Stickman" is the culmination of a late phase, as a number of the flattened toroids fold up to form the stickman's head. This squatting figure is one of the more stable (longer-lasting) plasma “instabilities,” and in this phase it was the the brightest and most terrifying component in a configuration of stunning impact on human imagination. The discharge form was recorded on stone by all human communities that witnessed it, and it influenced sacred designs across several millennia. (See, for example the Chinese Longevity Symbol.) Often, as in the colorful images above, the designs will explain themselves through comparative analysis. But it is also helpful to remember that the configuration was visually alive. The “arms” of the celestial figure, for example, were not stationary but dynamic toruses, “warping” or folding upward, then downward, then upward again. 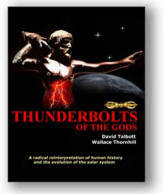 See David Talbott and Wallace Thornhill, Thunderbolts of the Gods, pp. 21ff. and 52ff.